Will New York Times correct errors in Dec. 2, 2014 carriage horse story? (“Carriage Horse Proposal’s Effects Might Not Be As Good as Its Intentions”) with great interest, especially the aspects relating to the closure of horse slaughter plants, a topic I’ve spent the last three years researching and writing about for the national news media (Forbes, Newsweek/Daily Beast, Huffington Post) as well as a 25-chapter book proposal and movie script (now nearing completion) on the same subject. 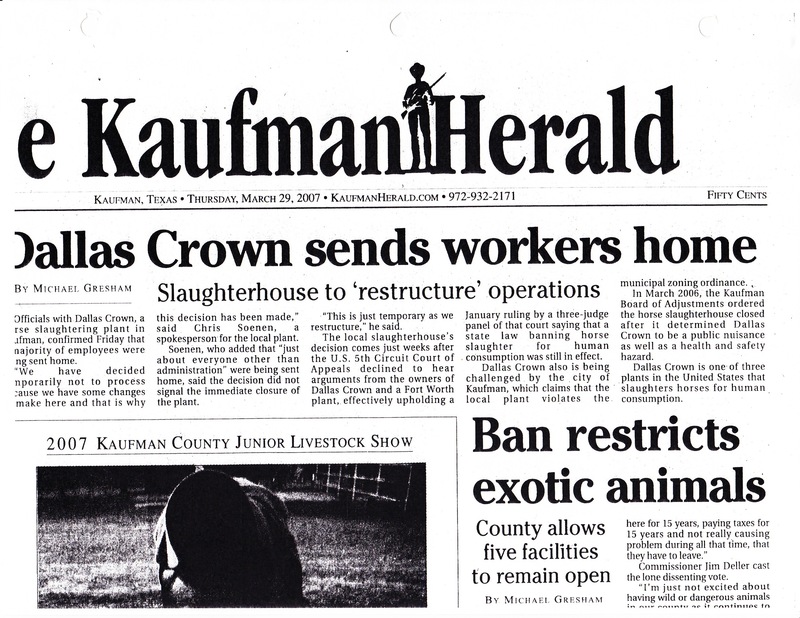 For further proof, please see article from the Kaufman Herald, where Dallas Crown, one of the last three operating US horse slaughter plants, shut its doors. The last three US slaughterhouses for horses closed in 2007, not 2006, as so much of the news media has falsely reported. The article “Dallas Crown sends workers home” is dated March 28, 2007. This is the same day that US Federal District Court Judge Colleen Kollar-Kotelly held that the slaughter of horses in America violated Federal law. ( see story here). BelTex (Fort Worth), also closed in 2007 as did Cavel, the third plant (in Dekalb, IL), which operated until the Seventh Circuit Court of Appeals ruled in favor of a lower court’s earlier decision on the constitutionality of a state law banning the practice of horse slaughter. This happened on September 21, 2007. Cavel’s appeal was denied and its temporary injunction to operate was revoked, making it the last US horse slaughter plant to close — again, in 2007. (see story here). The abuse and neglect you cited from the GAO report, like the claim that the plants “effectively shut” in 2006, has been widely misreported in the news media, particularly by the Associated Press, which I contacted when they made the same false claims. (AP now uses the correct date of plants effetively closing in 2007 and has dropped the correlation with rising abuse and neglect). Abuse and neglect rates reported in a 2011 GAO report went up while slaughter plants operated. Abuse and neglect rates since the closing of the slaughter plants are most closely correlated with rising cost of hay, as shown in a peer-reviewed study by the Equine Welfare Alliance. 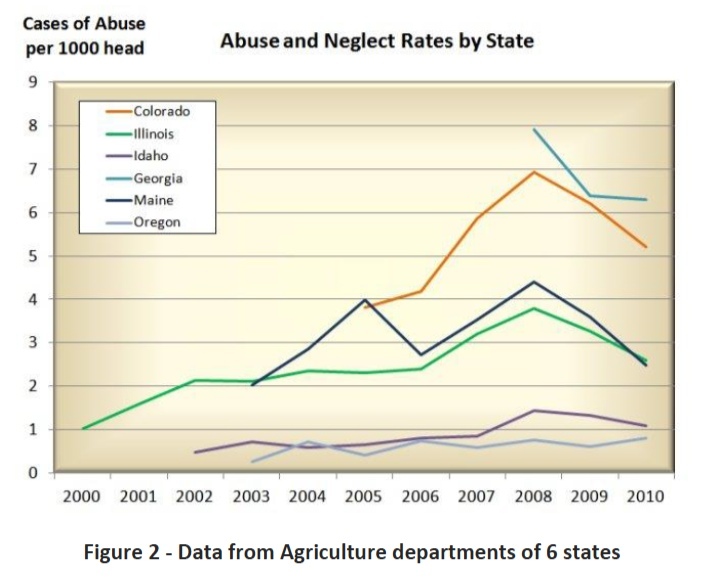 The reason is that the rising rates of abuse and neglect cited by GAO do not correlate with a 2007 plant closing date. Look at the chart. Here, you see ten years of data (only five years of which are referenced in the GAO report…2005-2009). You’ll see that for six different states, abuse and neglect rates rise during the entire time period that the plants remained operating. In Colorado, whose data the GAO singled out, you’ll see clearly that rising abuse and neglect rates are correlated with the years that the plans remained OPEN — not when they closed, as your article falsely claims. The source of the data is state veterinarians. If you would like a more complete analysis of it, please see this document. The report was prepared by the Equine Welfare Alliance. You can look at the methodology of collection and analysis. I have gone through it and find it accurately analyzes the data that your article (and other news organizations) got wrong. The longer story here is whether or not the news media should believe a small equine welfare organization, or the AP and the GAO. As one who has spent the last three years studying this topic, I can tell you that the EWA has got this right; the AP got it wrong. I don’t say that without having spent a lot of time looking at both sides and speaking extensively with AP editors, notably Traci Carl, and standards editor, Thomas Kent. And, as I mentioned earlier, the AP, beginning in January of 2014, has corrected itself, using the correct date of closing (2007) and dropping all references to the GAO and abuse and neglect. The New York Times should do the same. I applaud you for looking at the carriage horse situation, but to compare finding homes for 200 horses to those that ended up abused and slaughtered back when these plants operated is a false parallel. Thank you for your time and concern. Please reach out to me with any questions. I would be happy to provide further information to you and the editors of The New York Times to substantiate any and all of the above.